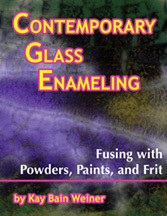 "Contemporary Glass Enameling: Fusing with Powders, Paints, and Frit, is a fascinating and colorful text by Kay Bain Weiner. With 168 pages and over 200 color photos, it covers a wealth of traditional and innovative contemporary glass enameling techniques. It contains ‘’How-To’’ photos and instructions for creating tableware, dividers, box and lamp panels, tiles, sun catchers, and jewelry. The book instructs on how to decorate glass by brushing wet enamel paints or sifting dry enamel powders, and frit using stencils, unique tools, and gadgets. Included are details on various paints, brushes, expressive brush strokes, and distinctive enamel paint applications. Learn how to combine hot glass inclusions (sheet copper, gold and silver leaf, wire, mica flakes) to achieve special effects. Learn how to use decals, luster, and gold and silver paints. The book also includes valuable information on fusible glass, enamel color selection, molds, kilns, firing and annealing." Chapter 1: What is Enameling? Chapter 2: Enamel Powders, Paints, and Glass. Chapter 4: Creating Stencils and Sifting Enamel Powders. Chapter 5: Mixing and Applying Enamel Paints. Chapter 6: Brush Types and Strokes. Chapter 7: Unique Enamel Paint Applications. Chapter 8: Additions and Inclusions for Special Effects. Chapter 11: Firing Enamel Projects. Chapter 13: Safety in the Work Area.